Dalintober beach buzzed as the inaugural Campbeltown Community Regatta exploded into action. 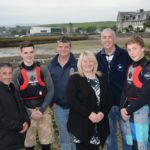 The revived shore rejuvenated with 150 tons of sand and last Saturday’s wall-to-wall sunshine plus a myriad range of water sports opportunities, proved what an appetite there is for further development of the Kintyre Seasports Project’s plans. Across on the sailing club slip Sid Gallagher worked tirelessly to organise boat- based activities. Mr Gallagher said: ‘Thanks to Argyll and Bute council Supporting Communities Fund and The Rotary Club of Campbeltown, which provided funding to make the event possible. 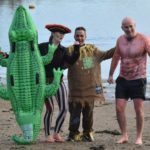 ‘Projects had to get community support through votes from the public, so a massive amount of thanks should go to all those who voted for the Community Regatta on the Argyll and Bute Supporting Communities website. ‘There was a huge effort on the part of volunteers, both in the months leading up to the regatta and on the actual day. 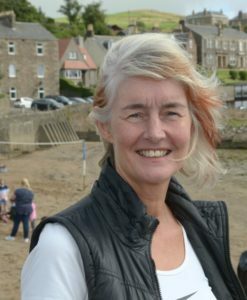 Architect Irene Bradley of the Edinburgh partnership John Renshaw Architects, hired to undertake an options appraisal and public consultation, arrived for the day and was amazed by what she witnessed. Ms Bradley was brought up near Ballycastle in Ireland and later spent much time living aboard a 41ft yacht. Kintyre Seasports Project chairman, Campbell Fox said: ‘In June Michael Russell MSP convened a meeting of national agencies – HIE, RYA Scotland, Sportscotland and VisitScotland – to discuss the Seasports project. ‘The focus was on how it could be funded, not why. 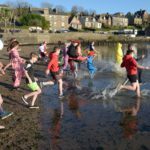 ‘The reason is that the Kintyre Seasports SCIO, with 16 partners and eight corporate members, combines local community groups and sports clubs in a single organisation. It appears that competing projects in other regions have not achieved anything near this level of co-operation. ‘The hugely successful Community Regatta proved the point: volunteers from different groups worked on the event for months.